Tauro offers tailor-made office space. According to your requirements, following a formula which has been successfully implemented since 1994. Currently, Tauro provides office space to almost 400 entrepreneurs in various locations in the Randstad. Big(ger) companies who are looking for office space of over 200 m² are also very welcome at Tauro. As an entrepreneur, you obviously want to be able to do business in an inspiring environment, including a beautiful prestigious office space. Tauro helps you shape this environment. With our unique rental concept, Tauro offers you the option to rent tailor-made office space. You rent an open-plan office space, which you can subsequently arrange to your own liking and needs. Our office spaces are offered semi-furnished and provided with modern office facilities. You can, according to your needs, make use of Tauro services, such as reception and telephone services. You can also use the meeting and conference rooms at other Tauro locations. Entrepreneurs who are looking to rent small(er) office space or who are not looking for a permanent office space, can also rent office space from 20 m², Flex Workspaces, workspace subscriptions or even just a Virtual Office with Tauro. Characteristic of renting office space with Tauro are the extra optional facilities and services provided. For example, every business centre has a professional looking reception area, a welcoming reception desk and several meeting and conference rooms, available to hire by the hour. In addition, Tauro provides services such as administrative support, mail handling, and fax and telephone services. You only pay for what you use! Flexible, transparent and affordable; Tauro gives entrepreneurs space. As a result of the new way of working, a big company can save 20 to 30 percent on the number of square metres of office space they need. By making optimal, smart use of the shared areas available at Tauro (flexible workspaces, meeting rooms, Tauro Entrepreneurs’ Lounge etc. ), the number of square metres needed can be reduced considerably as employees are, in fact, never all present at the same time. Say you have a company of 100 employees, 30 of whom are field sales representatives. Normally, you would have to rent hundreds of square metres to provide a workspace to everyone. Through smart use of shared spaces and by giving your field sales representatives a flexible workspace as provided by Tauro, you can save 20 to 30 percent in office space! What’s more, by creating a constantly changing working environment, your employees will actually be stimulated in a positive way. At Tauro, anything is possible: start small and expand gradually (or, on the contrary, fast)! 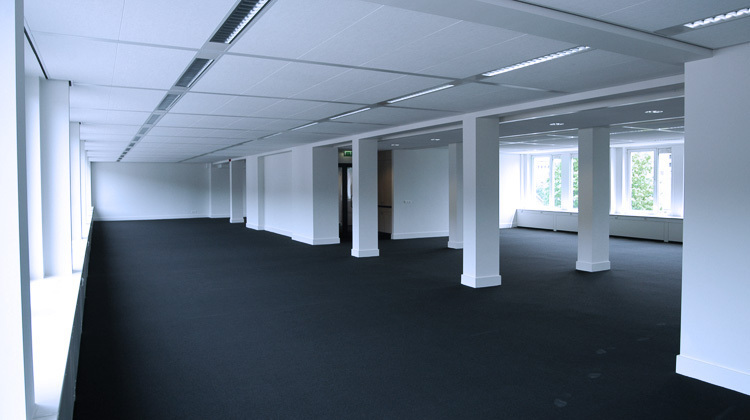 More information about renting large office spaces with Tauro? We will contact you!